7 economic and business data. Prerequisite: Graduate standing or consent. This course may be taken for credit at the undergraduate or graduate level but not both. ECON 530 Management Science A study of mathematical modeling and problem solving applied to business issues. Topics include linear programming, integer programming, decision making under uncertainty, game theory, and inventory modeling. Prerequisite: Graduate standing or consent. This course may be taken for credit at the undergraduate or graduate level but not both. 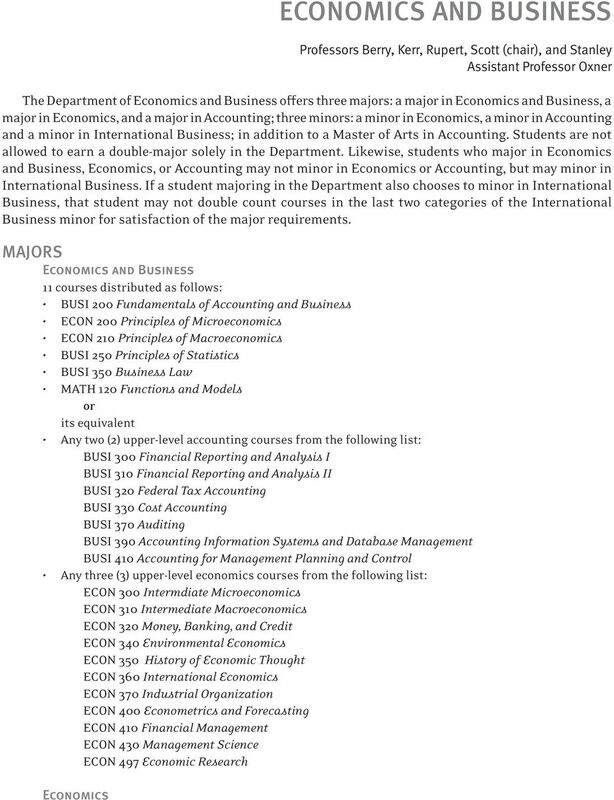 ECON 550 Managerial Economics Application of the tools of economic theory and statistics to managerial decision making. Topics include demand analysis, production theory, quantitative cost analysis, market analysis, and the theory of investment. Prerequisite: Graduate standing or consent. ECON 570 Industrial Organization The application of microeconomics to the problems of monopoly, oligopoly, restraints of trade, and other market imperfections. The course also focuses on the economic rationale for antitrust policy and regulation of public utilities. Prerequisite: Graduate standing or consent. This course may be taken for credit at the undergraduate or graduate level but not both. 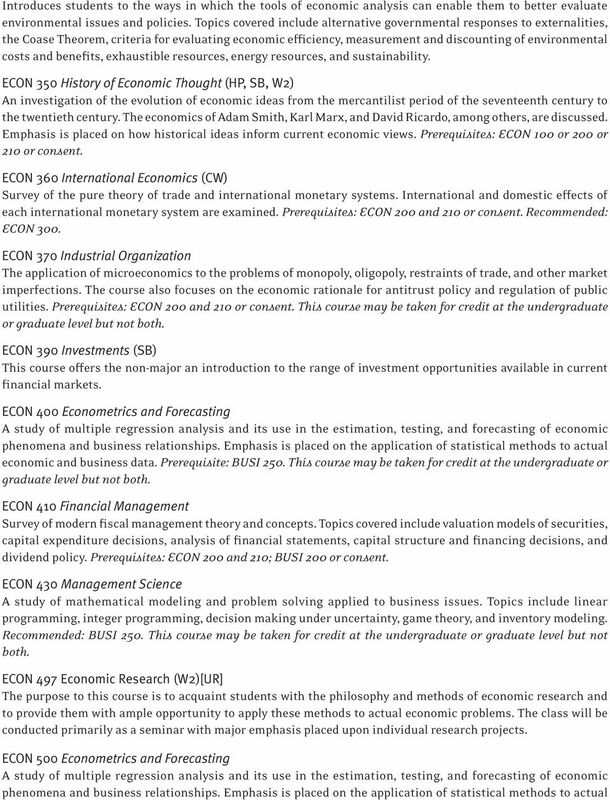 ECON 590 Economic Research The purpose to this course is to acquaint students with the philosophy and methods of economic research and to provide them with ample opportunity to apply these methods to actual economic problems. The class will be conducted primarily as a seminar with major emphasis placed upon individual research projects. Prerequisite: Graduate standing or consent. Business BUSI 100 Contemporary Issues in Business and Entrepreneurship (CW, SB) This introductory course will cover issues, problems, and opportunities that local and international businesses and entrepreneurs face in the contemporary world. Topics include organization and management of businesses and not-for-profits, reading and interpreting financial statements, quantitative decision-making tools, biographies of companies and their founders, ethical issues, and interactions between businesses and other segments of society such as the government, legal, labor, financial, and not-for-profit segments. 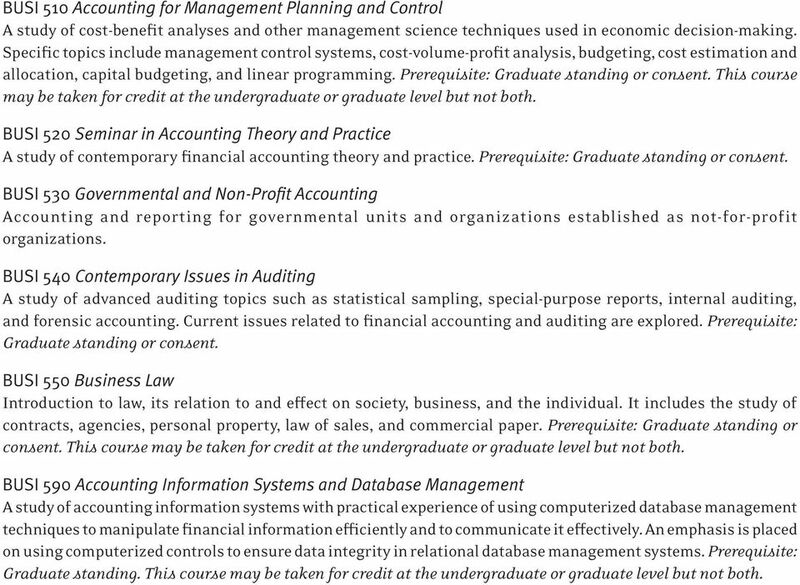 BUSI 200 Fundamentals of Accounting and Business A study of the generally accepted accounting principles and procedures of accumulating, measuring, and interpreting financial data of a business enterprise for use in financial reporting and in managerial decisionmaking. BUSI 250 Principles of Statistics (QS) A study of representations and interpretations of our contemporary world of data. Topics include descriptive statistics, graphical presentations, statistical estimation, hypothesis testing, and regression analysis. Emphasis is placed on applications to business data. 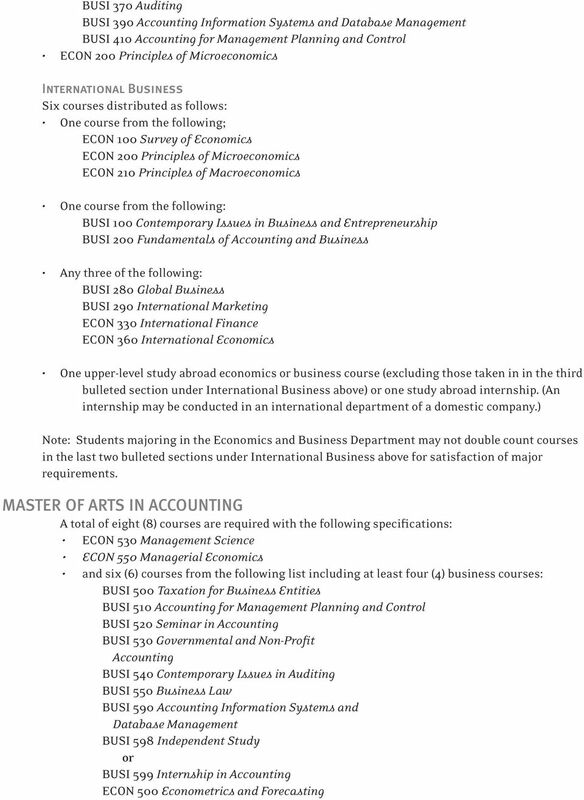 BUSI 280 Global Business An introductory study of political, cultural, and economic international business environments with an emphasis on applications of multinational financial management, investments, accounting, and business planning. 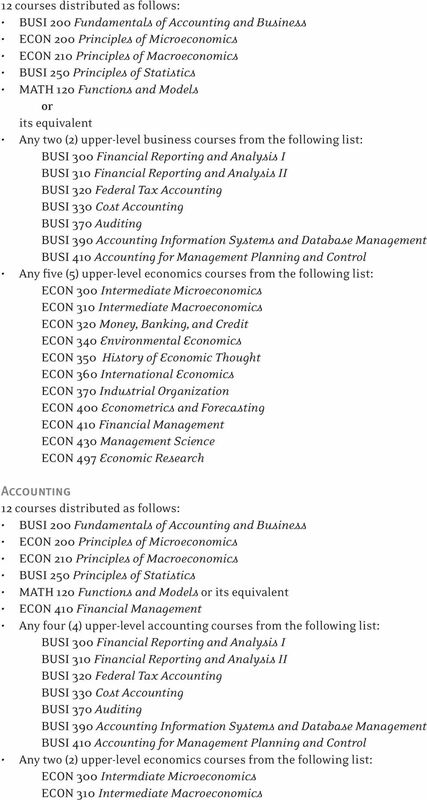 Prerequisites: One course from ECON 100, ECON 200, or ECON 210, and one course from BUSI 100 or BUSI 200. 8 BUSI 290 International Marketing This course examines the marketing function and the execution of successful marketing practices for both domestic and international markets. Using recent research and real world examples, the course will provide the student with an understanding of basic marketing concepts, fundamental practices, marketing terminology, and related technologies in the field. 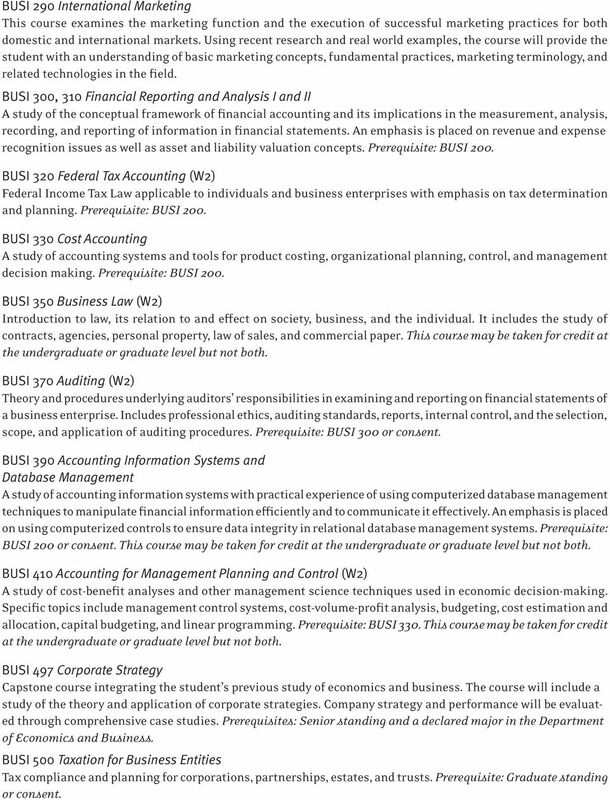 BUSI 300, 310 Financial Reporting and Analysis I and II A study of the conceptual framework of financial accounting and its implications in the measurement, analysis, recording, and reporting of information in financial statements. An emphasis is placed on revenue and expense recognition issues as well as asset and liability valuation concepts. Prerequisite: BUSI 200. BUSI 320 Federal Tax Accounting (W2) Federal Income Tax Law applicable to individuals and business enterprises with emphasis on tax determination and planning. Prerequisite: BUSI 200. A study of accounting systems and tools for product costing, organizational planning, control, and management decision making. Prerequisite: BUSI 200. BUSI 350 Business Law (W2) Introduction to law, its relation to and effect on society, business, and the individual. It includes the study of contracts, agencies, personal property, law of sales, and commercial paper. This course may be taken for credit at the undergraduate or graduate level but not both. BUSI 370 Auditing (W2) Theory and procedures underlying auditors responsibilities in examining and reporting on financial statements of a business enterprise. Includes professional ethics, auditing standards, reports, internal control, and the selection, scope, and application of auditing procedures. Prerequisite: BUSI 300 or consent. BUSI 390 Accounting Information Systems and Database Management A study of accounting information systems with practical experience of using computerized database management techniques to manipulate financial information efficiently and to communicate it effectively. An emphasis is placed on using computerized controls to ensure data integrity in relational database management systems. Prerequisite: BUSI 200 or consent. This course may be taken for credit at the undergraduate or graduate level but not both. BUSI 410 Accounting for Management Planning and Control (W2) A study of cost-benefit analyses and other management science techniques used in economic decision-making. Specific topics include management control systems, cost-volume-profit analysis, budgeting, cost estimation and allocation, capital budgeting, and linear programming. Prerequisite: BUSI 330. This course may be taken for credit at the undergraduate or graduate level but not both. 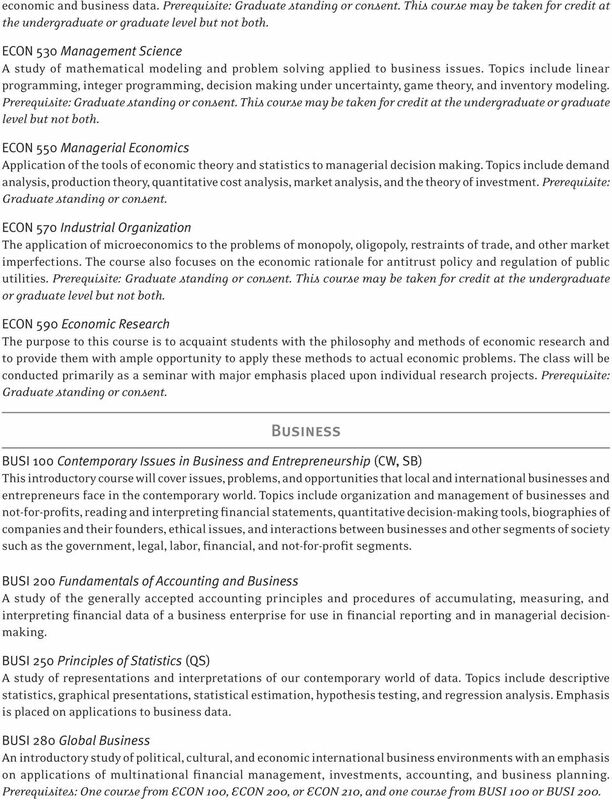 BUSI 497 Corporate Strategy Capstone course integrating the student s previous study of economics and business. The course will include a study of the theory and application of corporate strategies. Company strategy and performance will be evaluated through comprehensive case studies. 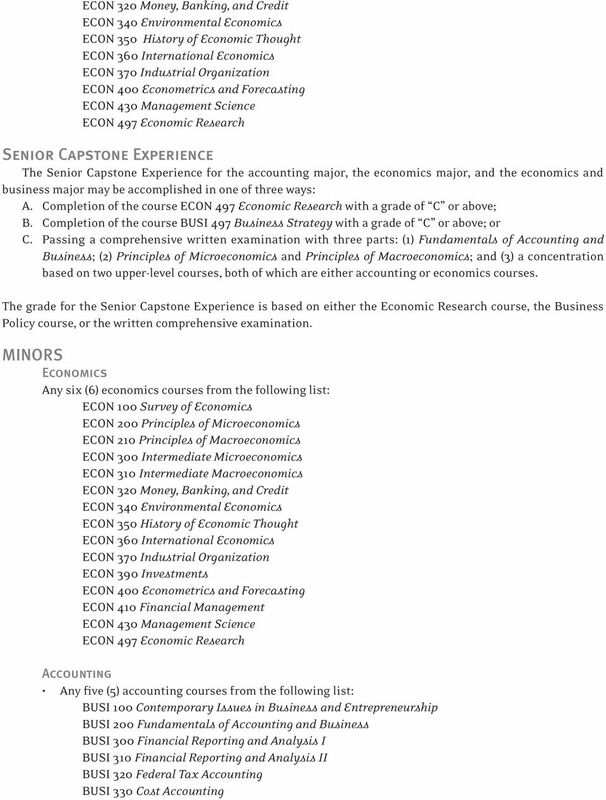 Prerequisites: Senior standing and a declared major in the Department of Economics and Business. BUSI 500 Taxation for Business Entities Tax compliance and planning for corporations, partnerships, estates, and trusts. Prerequisite: Graduate standing or consent. 9 BUSI 510 Accounting for Management Planning and Control A study of cost-benefit analyses and other management science techniques used in economic decision-making. Specific topics include management control systems, cost-volume-profit analysis, budgeting, cost estimation and allocation, capital budgeting, and linear programming. Prerequisite: Graduate standing or consent. This course may be taken for credit at the undergraduate or graduate level but not both. BUSI 520 Seminar in Accounting Theory and Practice A study of contemporary financial accounting theory and practice. Prerequisite: Graduate standing or consent. BUSI 530 Governmental and Non-Profit Accounting Accounting and reporting for governmental units and organizations established as not-for-profit organizations. BUSI 540 Contemporary Issues in Auditing A study of advanced auditing topics such as statistical sampling, special-purpose reports, internal auditing, and forensic accounting. Current issues related to financial accounting and auditing are explored. Prerequisite: Graduate standing or consent. BUSI 550 Business Law Introduction to law, its relation to and effect on society, business, and the individual. It includes the study of contracts, agencies, personal property, law of sales, and commercial paper. Prerequisite: Graduate standing or consent. This course may be taken for credit at the undergraduate or graduate level but not both. BUSI 590 Accounting Information Systems and Database Management A study of accounting information systems with practical experience of using computerized database management techniques to manipulate financial information efficiently and to communicate it effectively. An emphasis is placed on using computerized controls to ensure data integrity in relational database management systems. Prerequisite: Graduate standing. This course may be taken for credit at the undergraduate or graduate level but not both. 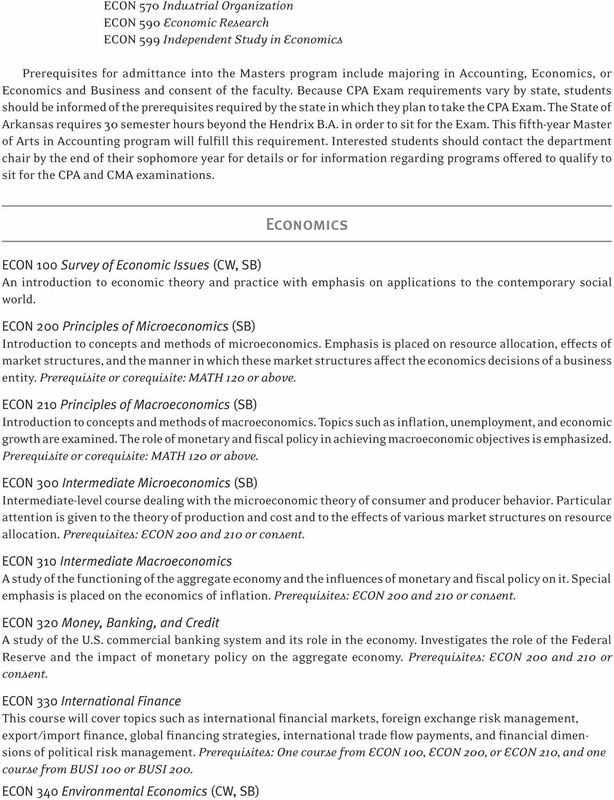 Finance and Economics Course Descriptions Finance Course Descriptions FIN 250 Financial Management This course addresses the theory and practice of financial management and the role of the Financial Manager.